The brill, Scophthalmus rhombus, is a species of flatfish in the turbot family. Brill can be found in the North Atlantic, Baltic Sea, and Mediterranean, primarily in deeper offshore waters. 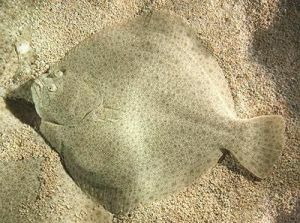 Brill have slender bodies, brown covered with lighter and darker coloured flecks, excluding the tailfin; the underside of the fish is usually cream coloured or pinkish white. Like other flatfish the brill has the ability to match its colour to the surroundings. Brills are on average between 40 cm to 75 cm in length and weigh up 3 kg. Part of the dorsal fin of the fish is not connected to the fin membrane, which gives the fish a frilly appearance. They are sometimes confused with the Turbot (Psetta maxima), which is more diamond-shaped, which is related and with which hybrids can be produced. On the west coast of Canada local fisherman refer to the Petrale Sole, Eopsetta jordanii as brill. In the kitchen Brill is delicious simply cooked. It can be poached, steamed, fried, seared or grilled, then served with a classic French sauce such as champagne beurre blanc. Incorporate it in soup-stews such as bourride or, for something more contemporary, try it raw as part of a sashimi platter.